Arisun Tires and Raceline Wheels are one in the same. Arisun Tires is known for making some gnarly six-ply and eight-ply ATV and UTV tires. Some are specific to certain terrains, while others are awesome all-terrain tires. 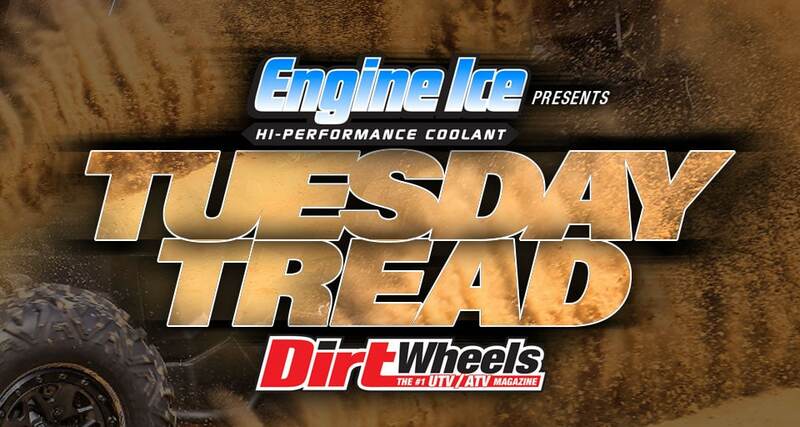 Raceline Wheels makes wheels for trucks, UTVs and ATVs. 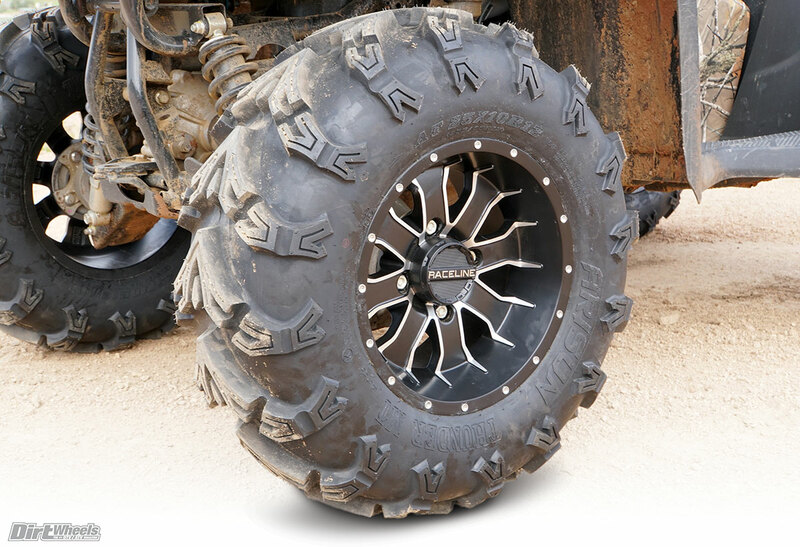 Their UTV and ATV wheels are built tough and can be purchased in simulated beadlocks, double beadlocks or standard beadlocks. Two of their products that caught our eye were the A77 Mamba simulated beadlock wheels in black and the Arisun Thunder MT eight-ply tires. Our 2017 Honda Rancher EPS 420 needed a more aggressive tire and wheel combo for the harsh desert terrain, and we felt the Arisun/Raceline combo would be a great solution. The Arisun Thunder MT is a heavy-duty, eight-ply radial tire. It offers a directional chevron tread design with deep lugs and large mud clean-outs. It also utilizes Arisun’s K4D Armor, which is an Aramid-reinforced material that provides added defense against punctures, cuts and abrasions. The Raceline A77 Mamba wheel is a simulated bead-lock, cast-aluminum wheel. It’s made from one-piece, 6061 cast aluminum and is stylish with its seven split spokes. They come with the center cap and tire valves installed. The Rancher 420 EPS model came with 12-inch wheels wrapped with Maxxis 24×8-12 tires in the front and 11-inch wheels wrapped with Maxxis 24×10-11 tires in the rear. For our test, we went with 12×7-inch wheels for the front and rear. We also went with taller 25×8-12 tires in the front and 25×10-12 in the rear. This way, down the road, it’s going to be easier to swap tires compared to having a different wheel size front and rear. First, we weighed the difference between the mounted stock tires and wheels to that of the mounted Thunder MT tires and the Mamba wheels. The stock front tire and wheel combo came in at 23 pounds per side, while the stock rear weighed in at 27 pounds per side. The front Thunder MT tire and Mamba wheel came in at 32 pounds per side, while the rear Thunder MT and Mamba wheel weighed in at 37 pounds per side. That’s a 9-pound difference in the front and 10-pound difference in the rear. We realize that is a significant weight gain, especially for our small-bore Rancher, but we also had to remember that the Thunder MT tire is a gnarly eight-ply radial tire. As expected, the Thunder MT tire ripped through mud holes and creek crossings without much effort. They provided ample traction in the wet environment, and, thanks to the clean-outs, the tires stayed relatively clean in the tread. These tires really surprised us in loose rocks. Being more of a mud tire, we thought they would struggle in rocky sections, but it crawled up hills riddled with loose rocks and boulders without losing traction. The weight of the tires did make the Rancher feel like it had a little less power on fire roads, and the tires did feel a bit bouncy at speed. Overall, we were stoked on the performance of the Arisun Thunder MT. They helped our small-bore Rancher do things it couldn’t have possibly done with the stock tires. Moving through the mud wasn’t an issue, creek beds were no problem, and they chewed up rocks like last night’s leftovers. These tires weren’t meant for high speeds, but they do handle corners well. The eight-ply rating gave us peace of mind and zero flats for the test. The A77 Mamba wheels are lightweight and gave our Rancher some needed style. Retail on the Thunder MT 25×8-12 tire is $129.95 per tire and $145.95 for the 25×10-12. The 12×7 A77 Mamba simulated beadlock wheel retails for $89.95 per wheel. Visit www.arisuntireusa.com and www.racelinewheels.com. THE NEW FEBRUARY 2018 ISSUE IS HERE!